Direct Mail is Hot Again. From Glossier to Quip, a variety of hip new companies is targeting millennials with … mailers? From postcards to catalogs, “hot, digitally savvy, direct-to-consumer” brands including Casper, Harry’s, Wayfair, Rover, Quip, Away, Handy and Modcloth have all started targeting customers via direct mail, Vox notes. Here’s why direct mail is hot again and how your business can use it effectively. Why is direct mail so hot? One reason is a higher trust factor. 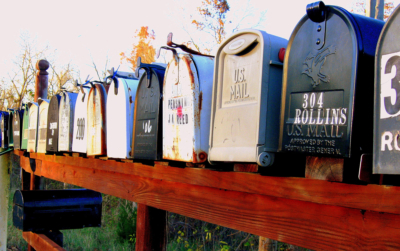 Younger consumers don’t associate direct mail with “junk mail” the way older consumers do. They’re more likely to attach that label to email. Direct mail can be more effective. While direct mail and email marketing campaigns get similar response rates, a recent study found direct mail campaigns generate purchases five times larger than email campaigns. Combining email with direct mail led to the best results of all: purchases six times larger than email alone generated. Direct mail stands out. Young people get hundreds of emails a day but only a few pieces of actual mail, notes one marketer quoted by Vox. In the same way digital-first companies such as Warby Parker and Glossier have begun opening physical stores to create a special experience, sending physical mail is a way to stand out from the crowd. Direct mail is more shareable. Unlike email that goes to one person, physical mail goes to a household. RetailWire reports 88 percent of key purchase decisions for retail, financial and automotive categories are discussed at home, and direct mail pieces give recipients a reason to talk over the offer. Direct mail has a longer lifespan. Email has a lifespan of just a few seconds, RetailWire reports, while direct mail’s average lifespan is 17 days. Start with your existing customers. If your direct mail isn’t relevant to the recipient, it will hit the circular file. More than two-thirds (68 percent) of consumers immediately throw away mail from a brand or retailer they haven’t heard of. However, 76% will discuss mail from a brand or retailer they have purchased from in the past. Target your mailings. Focus your mailings on people who have expressed interest either in your business or your category. Two-thirds of consumers will discuss mail from a brand or retailer they’ve never heard of if the category is of interest to them; 54% will discuss mail from a brand/retailer they have heard of, but not purchased from. You can target customer demographics using the USPS Every Door Direct Mail program, buy or rent mailing lists from companies like InfoUSA or DirectMail.com, or create your own house mailing lists. Style it right. If you’re trying to attract millennial consumers, think of your direct mail pieces as physical Instagram posts. Keep the text brief, the layout streamlined and the photography eye-catching. Make worthwhile offers. Email offers for discounts are a dime a dozen, clogging up the average millennial’s mailbox. But a glossy postcard or catalog with a special offer can catch the eye. Make it worth the customer’s while, not just a few dollars off. Create landing pages for your direct mail. Three-fourths of people who use direct mail to make purchasing decisions also consult online sources for more information, so drive them where you want them to go. If you’re sending out a direct mail piece promoting a sale on your store’s athletic shoes, for instance, include a URL that goes to a landing page for that specific offer. Don’t overload them. Direct mail is special precisely because your customers don’t get a lot of it. Carefully limit how often you send direct mail to avoid it becoming “spam” and eroding the recipient’s trust. For example, you could send direct mail with a special offer for a customer’s birthday, or after somebody makes their first purchase. Combine direct mail with email. Media Post suggests starting with direct mail and following up a week later with email. It also recommends sending two emails for everyone piece of direct mail. You can make direct mail part of your automated marketing campaigns by setting up triggers to send direct mail after a prospect takes certain actions, just as you would with a drip email campaign. Both the email and the direct mail piece should use the same design elements and messaging to reinforce your brand and your offer. Track results. Use landing page visits, coupon codes, and redemption rates to see how well your direct mail campaign is working.